What is the function pointer in C? Function pointer in C is similar to a normal pointer. 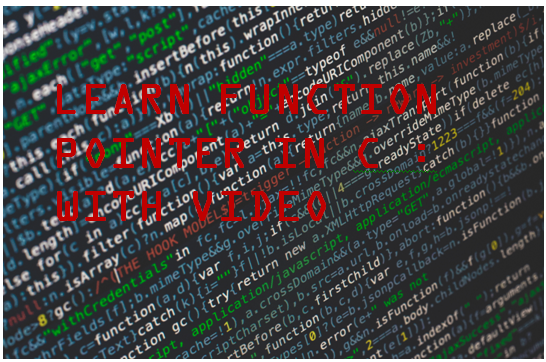 The difference between function pointer in C and in normal pointers is that normal pointers point to the address of data but function pointers point to the address of the function. Function pointer in C is also known as the pointer to function. Declaration of function pointer in C similar to function. The only difference is that whenever we declared function pointer we use * before declaration name and enclosed in parenthesis. In the above expression, p is a function pointer taking two arguments (int, int) and returns an integer. In the above expression, brackets play a very important role, if we removed brackets then it becomes int *p (int, int), which is the declaration of a function with two integer pointer as arguments and returns integer pointer. Function pointer in C is initialized similarly to the initialization of normal pointers in C.